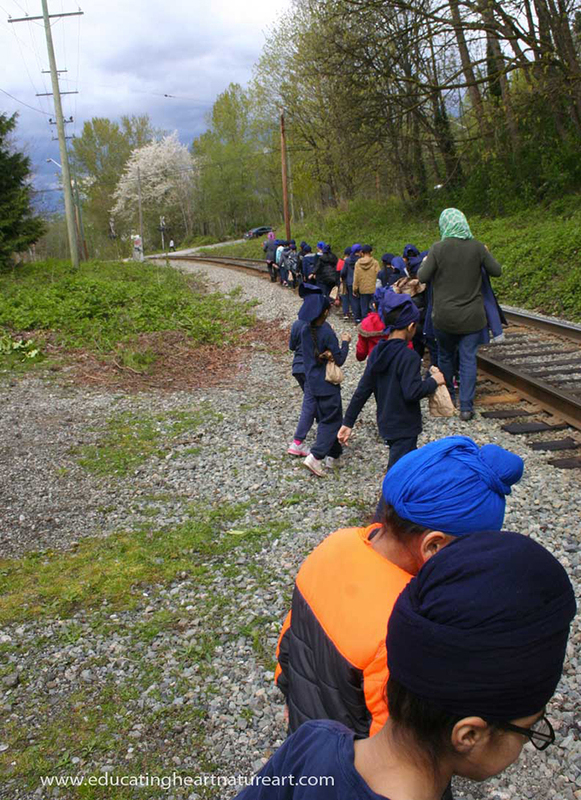 Today's guest blog comes from artist Marghanita Hughes, who recently embarked on a creative journey of discovery with students at Khalsa School in Surrey, BC. 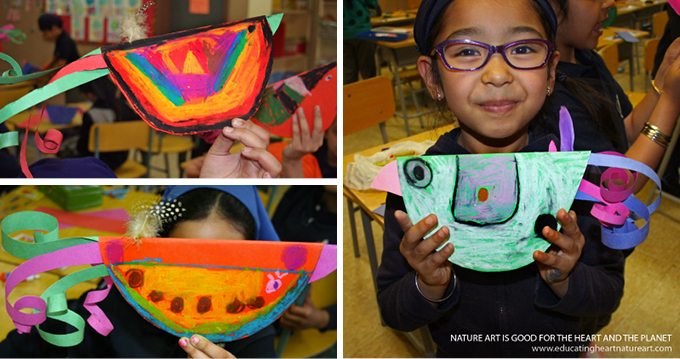 Supported by an Artists in the Classroom grant, together, they discovered that the joy of nature and art can be found in any environment. "In many cases, the school system doesn't celebrate gifts in the realm of art, music, poetry etc. Rather, the more logical analytical ways of knowledge are celebrated, such as math, science, and memorization. Sure, these are important gifts as well and they should be celebrated, but not all people fit into that mould. And then what happens to those gifts that are left untapped and never brought forward into our world for everyone to enjoy? Well, society wants us to believe that those gifts do not fit into our system and we can't make a living by utilizing them." "We all need to remember not to get so caught up in getting ahead that we forget about what brings us joy and what makes us really come alive. People living in their highest joy, and following their bliss and passion is exactly what the world needs right now, so find out what makes you come alive and go do exactly that, and see how quickly your world transforms." I wholeheartedly agree with Alanna Ketler and it is why I bring nature art into schools and homes. I believe we are all born artists, highly creative, beautiful, soulful beings... today we are killing the spirit of the child, the very essence of who and what they are! It breaks my heart to think of children who are not being given the opportunities to express themselves creatively... As Eleanor Roosevelt said, "The greatest gift you can give children is imagination". I am currently visiting an urban schoo where I am running nature art workshops for all the Grade 1 students (100 in total) with the help of their amazing classroom teachers and several Grade 11 helpers. Last week we took the students for a nature walk. It certainly was not the kind of nature walk I am use to: we had to cross two busy roads, one of which had no sidewalk, then along a railway to get in reach of some trees. Instead of listening and noticing nature along our walk, we had to be vigilant that we did not step onto the busy road and the only music to be heard was the constant roar of the busy traffic. However, once we reached a safe spot, we sat on the graveled ground and observed the trees surrounding us. We silently listened for birds. Very few birds were heard or seen, but when one did arrive, the excitement was explosive and contagious. The students drew what they saw and recorded their feelings. We managed to get up close to several pines offering different textures, forms and smells for the students to investigate. We proceeded to hunt for fallen branches, leaves and other foliage we would require for our nature art projects back in the classroom: butterfly life cycle mobiles, musical instruments, rocking birds, and stick people, to name but a few. To our delight we were incredibly fortunate to find a whole bunch of leaves that caterpillars had munched. 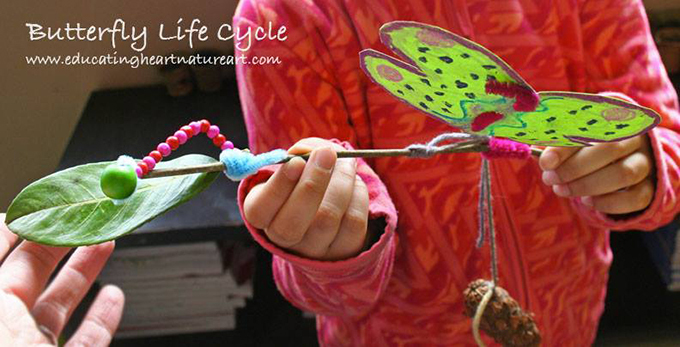 These were added to our butterfly life cycle mobiles. The fallen branches morphed into the most incredible stick people characters that led the children to create their very own storybooks featuring their stick person as the main character. And the excitement they had experienced when the heard the beautiful bird song flowed joyously into their stunning bird creations. So where did this nature art project begin? With imagination. Whilst listening to a most magical and enchanting piece of music by John Sherman I imagined the students as butterflies dancing in the forest of giant stick people along to the branch flute music. 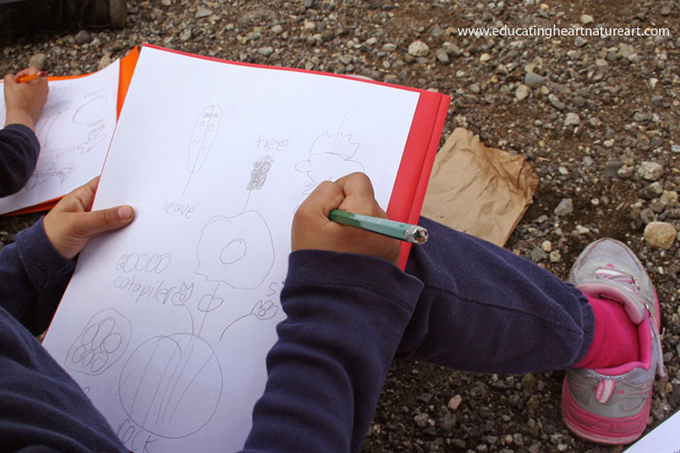 I envisaged the students learning about the endangered butterflies and trees, and creating stories together that celebrate the gift of all life, the gift of creativity and the gift of wonder and imagination and so the art project, Telling our Stories with the Help of Nature's Muse, was born. Thanks to the Artists in the Classroom grant funding from ArtStarts, I was able to bring this project to life. I believe that every adult has the responsibility to nurture a child's creativity and I will continue to strive to provide these opportunities to children all around the world, wherever they are living in an urban setting or in the countryside. It can, and must, become a part of every child's life and education! Together let us celebrate our creativity, let us celebrate our collective oneness and this amazing planet, we call earth. Be the change you wish to see in the world. Change begins with you and me!